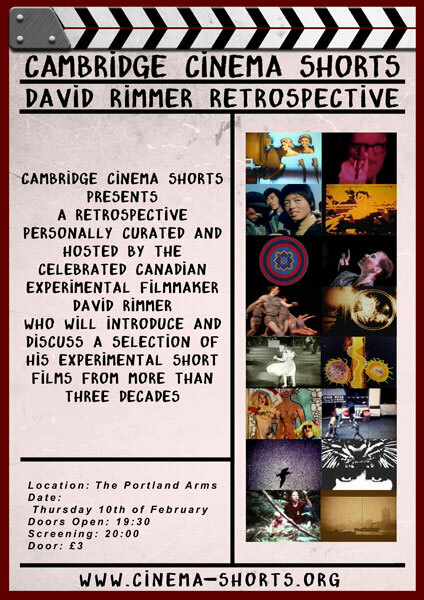 Cambridge Cinema Shorts presented a retrospective of celebrated Canadian experimental short film maker David Rimmer. 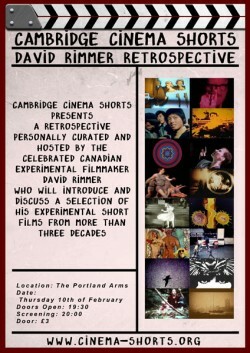 The evening was personally curated and hosted by David Rimmer who introduce and discuss a selection of his short films. Check out the video of Davids informal Q&A with the audience at the bottom of this page. David Rimmer, filmmaker, photographer (b at Vancouver 20 Jan 1942). Among Canadian experimental filmmakers, Rimmer is an exemplary craftsperson – his work is consistently subtle and intricate, and often rather sly. One of the finest technicians in the avant-garde, Rimmer has worked extensively with contact and optical printing and with videographics (in, for example, Divine Mannequin, 1989). He remains one of the steadiest, most consistent, most painstaking film artists in Canada.